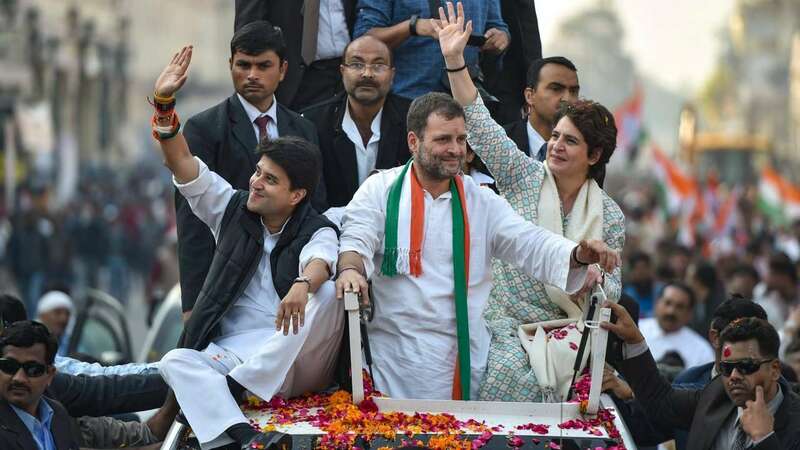 Feb 11 (AZINS) Asserting that Congress will "play on front foot" in Uttar Pradesh, Congress chief Rahul Gandhi on Monday said he and his party will not sit idle till it forms a government in the state and that is the mandate given to Priyanka Gandhi and Jyotiraditya Scindia. During a roadshow that marked his sister Priyanka's first public event after being appointed as national general secretary with charge of eastern Uttar Pradesh, the Congress president said he has asked her and Scindia, who has been made general secretary for western UP, their mandate is to bring a government in the state that will ensure justice for all. "Their aim is definitely the Lok Sabha elections, but also to bring a Cognress government here," he said. Asking crowd to repeat his "chowkidar chor hai" (guard is the thief) barb against Prime Minister Narendra Modi in connection with the Congress party's corruption allegation in the Rafale fighter jet deal, Gandhi alleged that the prime minister has "stolen" money from Uttar Pradesh and other states to benefit industrialist Anil Ambani.The government and Ambani's Reliance Group have denied the allegations levelled against them by Congress and other opposition parties. On Uttar Pradesh, where his party is struggling to regain lost grounds, the Congress chief said, "UP is the centre (and) heart of country. I have made Priyanka and Scindiaji general secretaries and told them that they have to fight injustice that is rampant in the state for years. They have to fight against it and bring a government that gives justice." Priyanka and Scindia were recently appointed by him as Congress general secretaries with charge of eastern and western UP, respectively, keeping in mind the Lok Sabha elections expected to take place in April-May. The Congress party had fared miserably in the state during the 2014 Lok Sabha elections by winning just two of 80 seats in the state. Using a cricket analogy, he said the Congress will play on the front foot and not on the back foot in the state. "Till a Congress ideology government is installed here (UP), we will not sit idle and ensure justice to the farmers, the youth, the poor," he added.